10% Discount on all UPVC Multipoint Lock Handles Enter Code UPVC at the Checkout.If you cannot find the item you require please take a look on our new website DoorHandleParts.com which we are currently adding more new products. Used with Multi point Locks normally found on uPVC and composite doors. (A). CENTRES(PZ) The distance between the centre of the handle spindle to the centre of the to of the euro hole cut out. (B). SCREW CENTRES The distance between the screw holes. (C). BACKPLATE The size of the back plate(length x width)in mm. 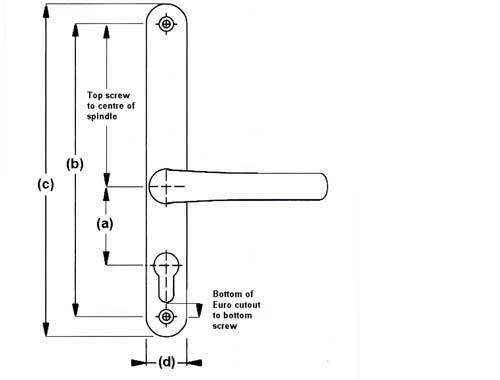 We have replacement UPVC Door Handles available in the following Centres(PZ) for details of measuring your Multipoint Lock Handles see the above guide. Please start by measuring the distance between the centre of the handle spindle to the centre of the top of the euro(lock) hole cut out. Then go to the relevant category where you will then find the available size options on screw centres and backplates. If you require any further information or help please email us the details. Buy replacement UPVC Door Handles from Door Handle Parts,Multipoint Lock Handles,Large selection of handles available in a wide range of sizes and styles from leading manufacturers.